Enjoy a pool-side party for your next birthday, family reunion, office or team at the La Crescent pool. 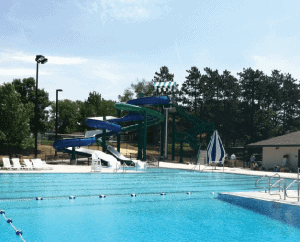 The pool is available for rental on Saturdays from 10:00 a.m. to 12:30 p.m. beginning June 9th and end August 25th. No parties will be scheduled on Saturday, June 23rd, due to a home swim meet. We allow food to be brought in but only in the concession stand area. Rental fee includes the cost of lifeguards, slide attendants, and manager on duty. Children and youth groups must provide one adult to every ten youth or children. Reservations must be made a minimum of two weeks in advance. Rental payment is due upon reservation. Rental fees will be refunded due to inclement weather.